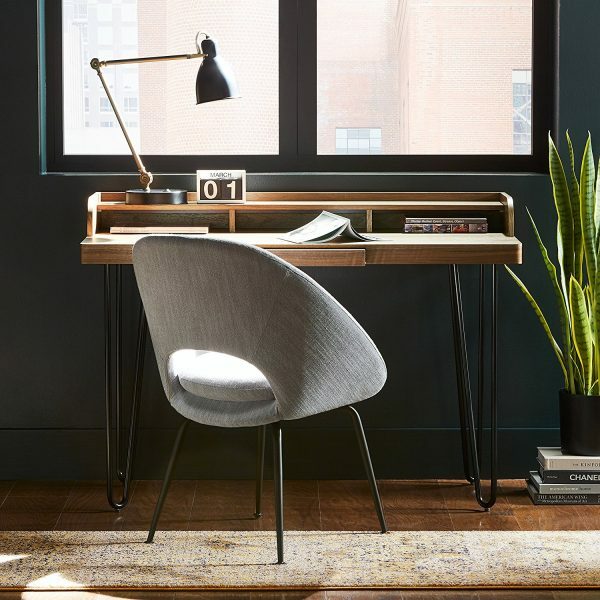 If you're trying to strike a balance between modern and functional for your home office, you know what an agonizing challenge it can be, especially when it comes to choosing the right desk. 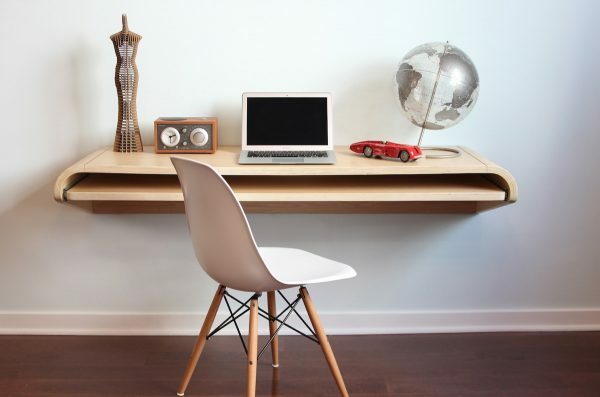 Because lets face it, we want our desk to be useful and practical, but we want it to look great while doing it. 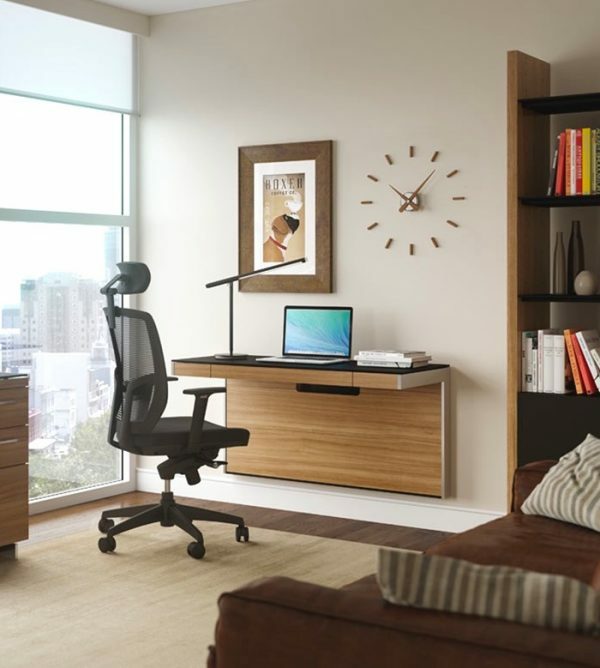 To help you out, we've rounded up a collection of the best modern home office desks for your workspace. 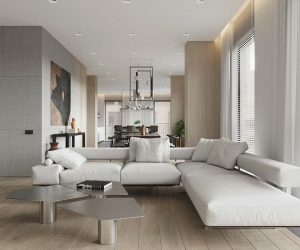 From the classic L-shaped to the clean and sleek minimalist, we made sure to include a little something for every style and budget. 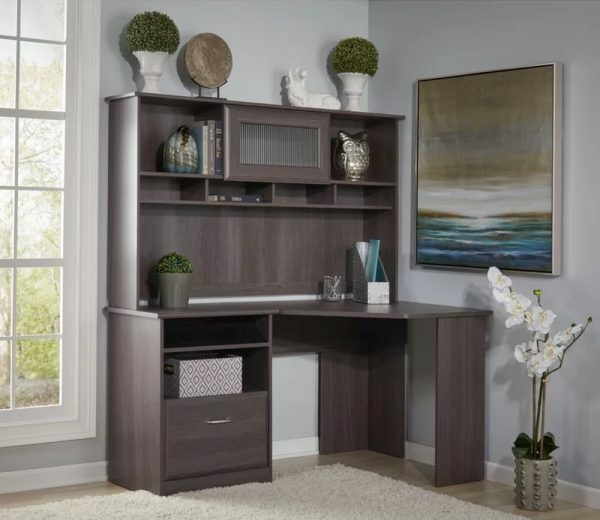 Modern Computer Desk With Cord Management & Slim Drawers: This stylish white and pine finish desk boasts cord management, a front drawer, and a hideaway top compartment to stash all your desktop odd and ends. The sturdy metal legs assure that it can hold up the 75lbs and it has a deceivingly large desktop space, so you don’t have to choose style over function. Curved Modern Computer Desk With Pull Out Keyboard Panel: A sleek rounded design that is ready right out of the box, all you have to is attach the legs. This modern computer desk has a pull out keyboard tray and two side drawers for your storage needs. 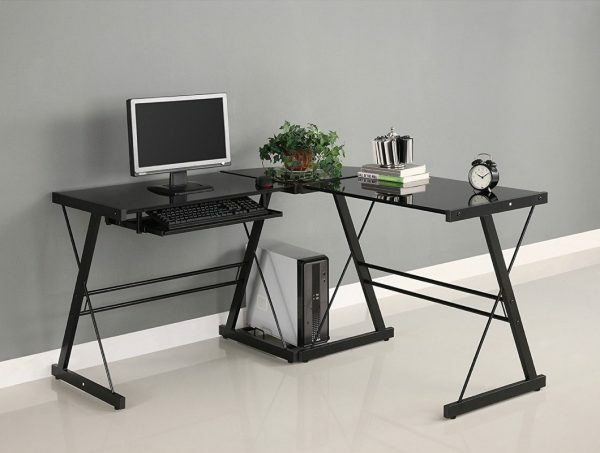 It has an 88 lbs weight capacity and is a great size for smaller home offices and workspaces. 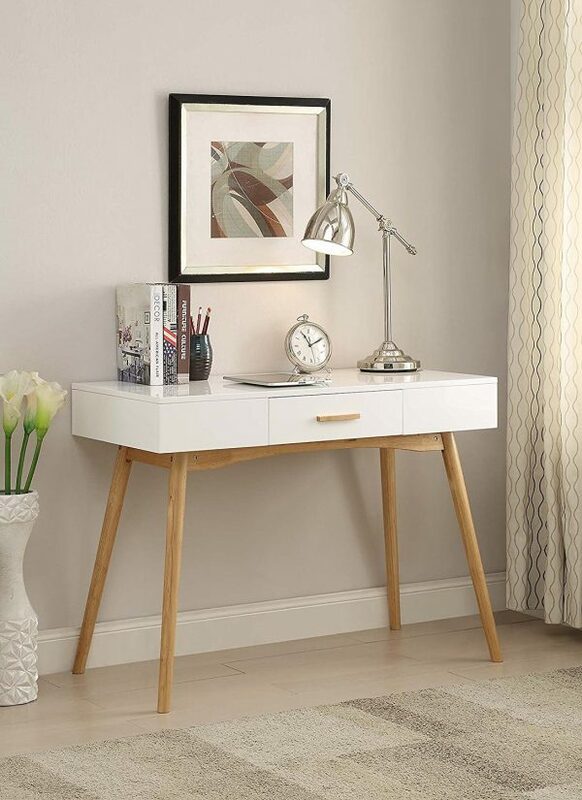 Scandinavian Style Desk With Drawer: This Scandinavian style desk is part of the Oslo collection which features clean lines, natural wood accents, and zen-like simplicity. Their furniture is created specifically to give a modern feel to the traditional or historic home and this desk is no exception. Not only is it sleek, but it is also affordable, easy to assemble, and durable with its high gloss finish. 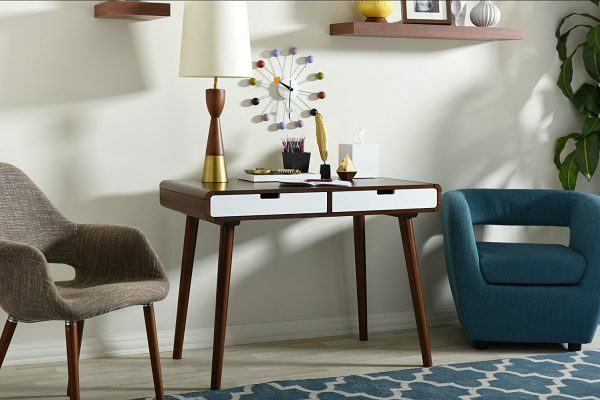 Walnut Finish Mid Century Modern Home Office Desk: The dark walnut finish contrasting against the white drawers make this Mid-Century modern writing desk an eye-catching solution to your office furniture needs. Not only is it beautifully designed with its rounded silhouette and clean lines, but it is also very functional with two front storage drawers. 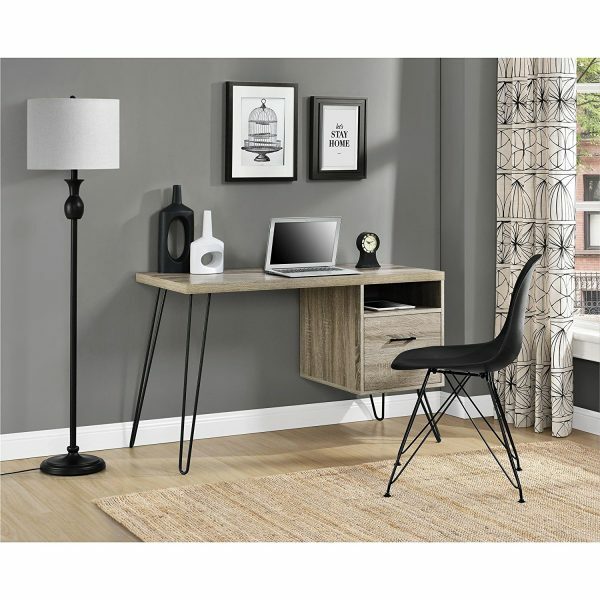 Modern Industrial Style Office Desk: The Ameriwood Home Landon Desk has a weathered oak finish and contrasting black hairpin legs, making it a great piece to integrate within your modern or industrial decor. 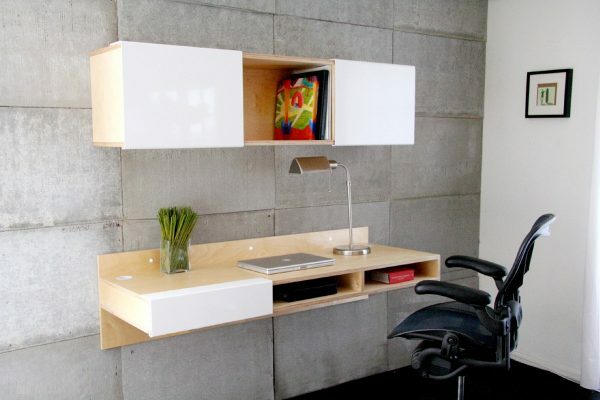 The desk has been designed with a small cubby to stash your laptop when it’s not in use and a file drawer underneath. There is also a matching bookcase available, the Landon. 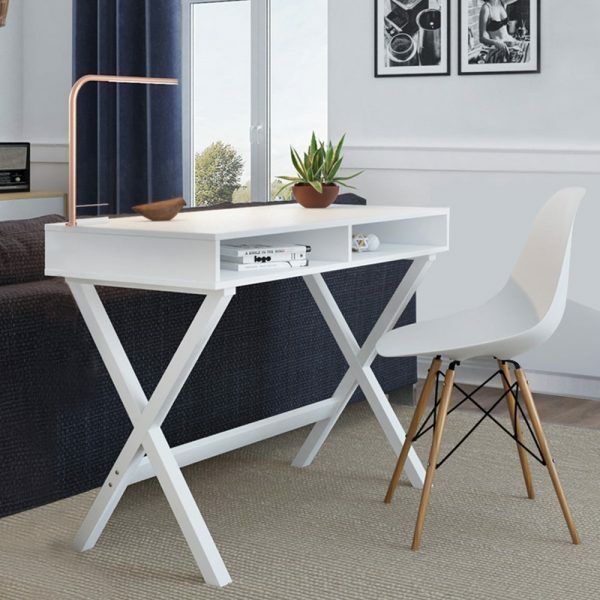 White Modern Minimalist Ikea MICKE Office Desk: The Ikea MICKE desk has a clean and simple design that is a gem for smaller spaces, such as apartments or dorm rooms. You can also combine this desk with other pieces from the MICKE collection to create a more elaborate and expansive workspace. Minimalist Rectangular Office Desk: This affordable, minimalist office desk designed by Zinus Modern Studio is simple enough to go with almost any decor. It has a sturdy metal frame and comes Brown, Espresso or White. 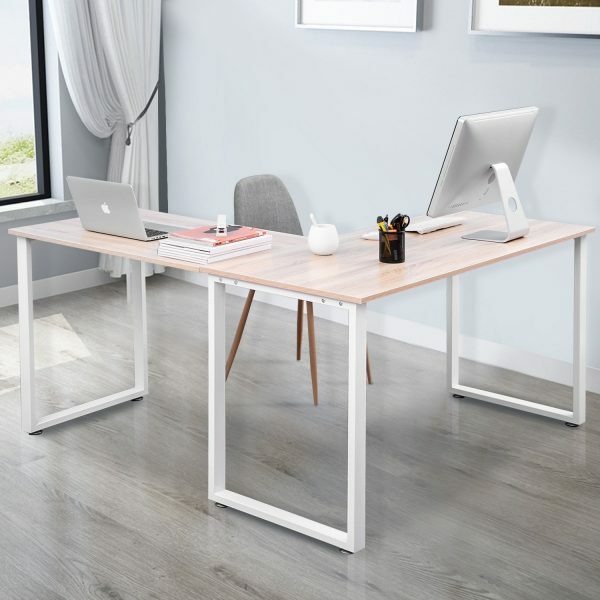 Small White Cross Legged Home Office Desk: This small and simple desk by Nathan Home helps you stay organized with two open storage compartments, which make a great place to squirrel your laptop or books to clear some extra desk space. Sturdy and durable, this desk is also anti-scratch and water resistant. Available in a Rustic Espresso or White finish (pictured). Dual Tone Writing Desk With Cubbies: The Brentry Writing Desk has a sleek and stylish dual tone finish and is available in Cherry, Walnut or Oak (pictured). 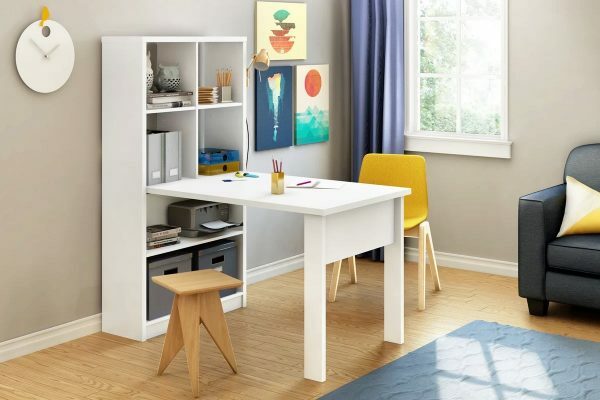 This affordable desk not only looks good, but it is also highly practical with its top sitting storage cubbies to stash your odds and ends. Two Tone Wooden Desk With Flip Up Drawers: This elegant writing desk from the Chiesa Collection is a minimalist’s dream. It has two-tone flip up drawers to hide any clutter and includes a hidden power plug outlet for cable management. It is available in 5 colors: Yellow, Frost Gray, Samba Red, Vulcan Black, and White. My Writing Desk: My Writing Desk is simply constructed, stylish, and functional. With drawers and high storage edges, you should have no problem finding room for all your office accessories. This desk is available in 2 sizes and various combinations of white, black, and natural wood. White Computer Desk With Cross Legs & Keyboard Pull Out Panel: A glossy white finish and chrome legs combine to create this contemporary office desk. 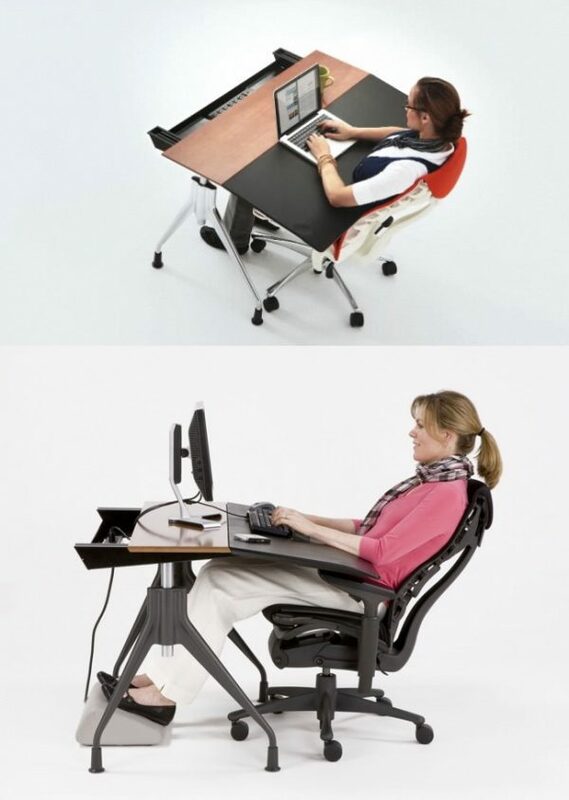 It features modern crossed legs and a pull out keyboard tray for your computer needs. 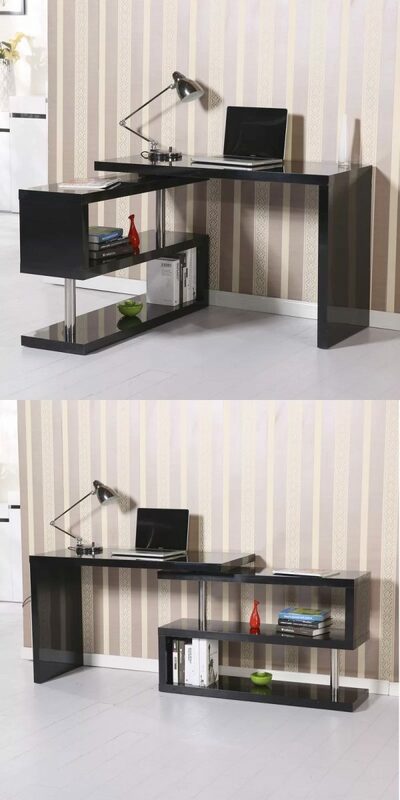 This desk is also available is a glossy black finish. Modern Writing Desk With Glass Top & Angled Wooden Legs: This modern writing desk provides comfort without giving up style. Featuring a shatter-resistant, tempered glass top with a white lacquered MDF-wood shelf underneath, this desk is very easy to clean and care for. Modern Office Table With Walnut Wood Veneer And Metal Legs: Rivet’s modern wood and hairpin leg desk has a sleek design that offers ample storage and workspace. It is constructed out of a mix of engineered wood, walnut veneer, and metal and features 3 top storage compartments, as well as a front drawer. 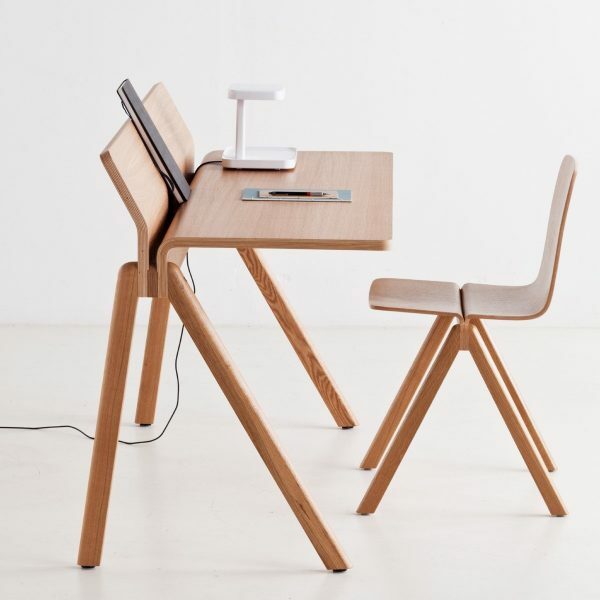 Copenhague Molded Plywood Desk: This Copenhague desk is a unique design configured around a minimalist A-frame concept. It is constructed using molded plywood, oak, and oak veneer. Plus, it features a back lip, which is great to hold source material for typing or drawing. 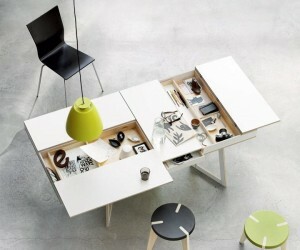 Home Office Table With Wall Storage Unit: A small office desk with a ton of storage power. The side shelf on this South Shore laminated particle board desk has 4 cubby holes and 2 shelves for your storage needs. Also available in black. Herman Miller Envelop Desk: This ergonomic desk with a contemporary design is made to do just what its name says, envelop you. Thoughtfully designed to slide toward or away from you, with a seventy-degree tilt to keep you in the correct ergonomic position. This desk is available in 4 colors. 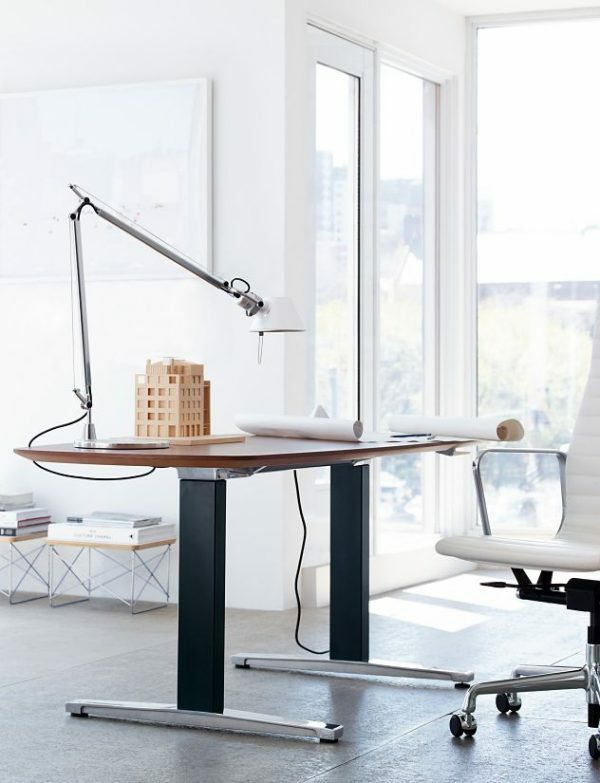 Herman Miller Airia Desk: The Herman Miller Airia desk is the perfect solution to keep your workspace elegantly clutter free. It has a cord management system, 3 flip top compartments, and a centralized drawer with organizational cork trays. Constructed with walnut, laminate, and aluminum, this desk also boasts being made of 54% recycled content. 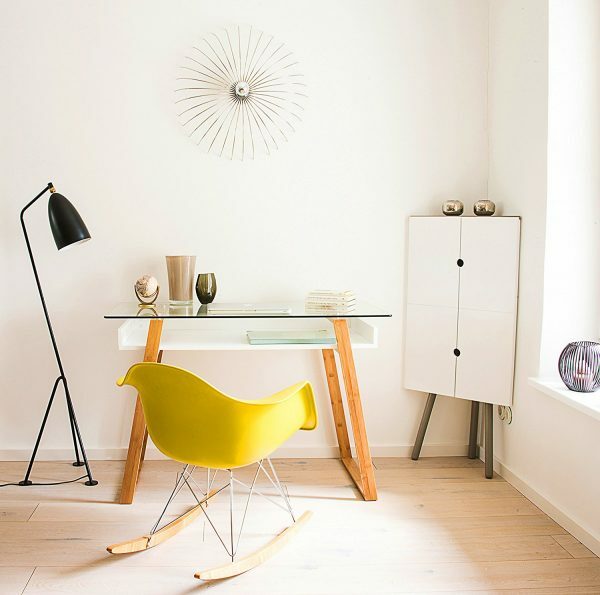 Modern White Office Desk With Storage drawers: This is the perfect mid-century style desk for your office. The Modway Warp contemporary desk is designed for small living and is complete with an easy to wipe, high gloss finish and steel base. For storage, not only does it have two medium drawers, but a large filing drawer as well. Modway Impression Desk: A modular desk with ample shelf storage is what you get with the Modway Impression. This fun and progressive design is made from a glossy fiberglass finish and is sure to impress. Available in Green, Orange, Yellow, and White (pictured). Contemporary White Desk With File Cabinet: Available in 3 colors with a reversible configuration, the Coaster Home Furnishings desk is an office treat. This simple design has plenty of storage with 3 drawers for your office supplies. Available in cappuccino, weathered gray, and white (pictured). 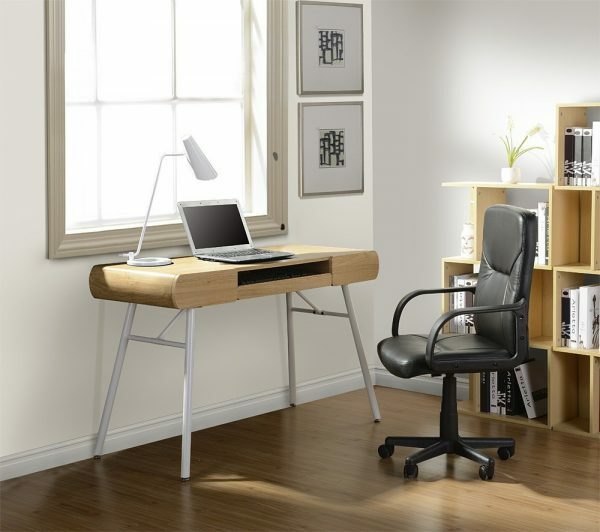 Leaning Desk With Bookcase: The Simonetti Leaning Desk is a unique and modern design that not only lends the user desk space, but shelf space as well. With Acacia hardwood solid construction and a Smoked Driftwood finish, it is not just a sturdy workspace, but also a rustic showpiece. 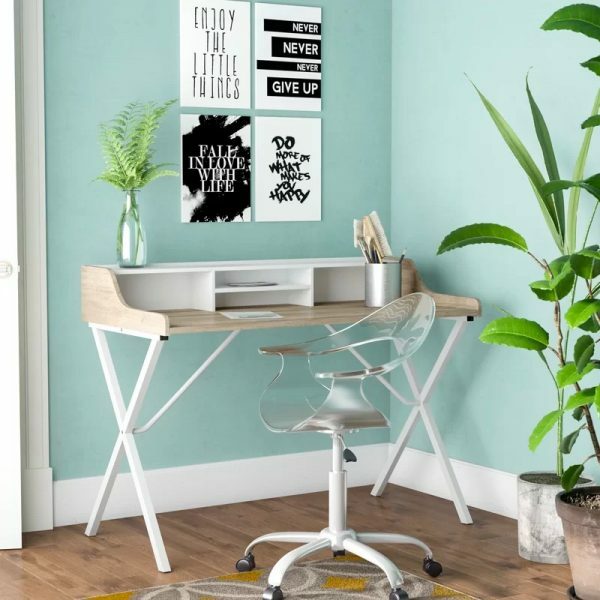 Curvy Minimalist Floating Desk: With rounded edges and a sleek design, this wall mounted desk features a pull out tray for your storage needs and lots of workspace. It is available in 5 finishes: Satin Black, Satin Red, Satin White, Walnut, and Rift Oak (pictured). Modern Minimalist Wall Mounted Desk: This LAXseries wall mounted desk is a dream for small spaces. Constructed with solid English Walnut and 100% recyclable aluminum, this desk has multiple convenient cubbies for storage. The matching wall mounted shelf is also available for purchase. Glass Top Wall Mounted Desk With Wire Management: A high quality, wall mounted desk with wire management, a micro etched glass top, and sturdy construction is what you will get from this wall mounted desk. This modern and sleek design is available in 2 finishes: Chocolate or Natural Walnut (pictured). 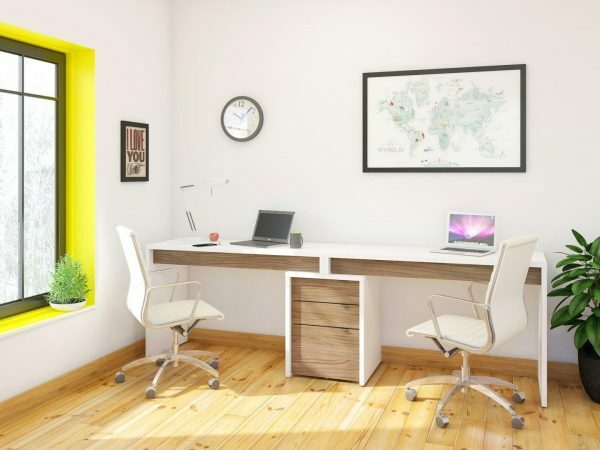 Wall Mounted Floating Desk With Hutch: This cute, white floating desk is not only mountable at any height, but it also features a cable and wire management system to hide those unsightly cords. The two side compartments also have removable shelves to accommodate storing various sized office supplies. 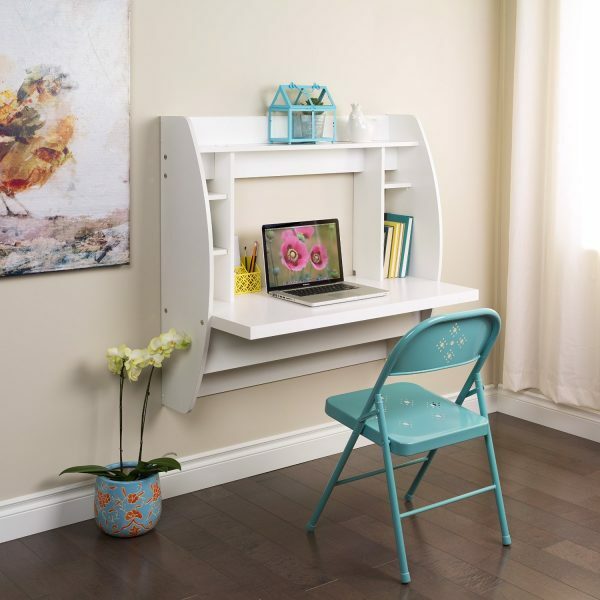 Wall Mount Corner Desk: This white, wall corner desk is a great solution for students needing to save space. With two cubby holes for storage and plenty of desk space, it is the perfect place to pull out your laptop or write you next paper. Wall Mounted Cabinet To Desk Convertible: Your laptop folds away, so why shouldn’t your desk too? 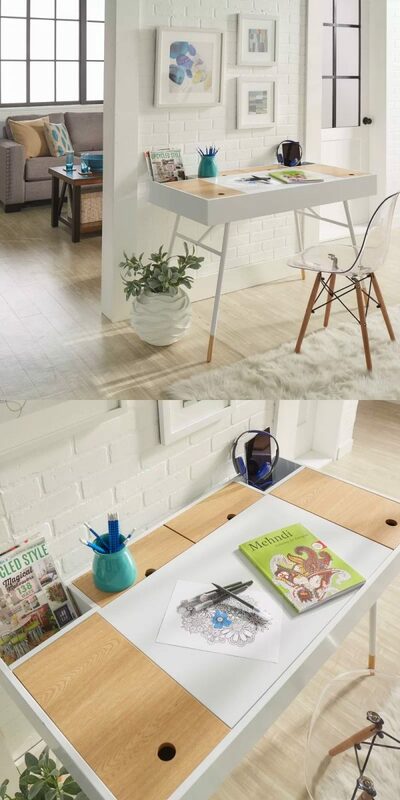 This convertible, wall mounted desk folds down when your need it and then folds back on to the wall when you don’t. Possibly the ultimate space saving solution for those living in a small apartment or dorm room. This desk is available in both Black or White (pictured). 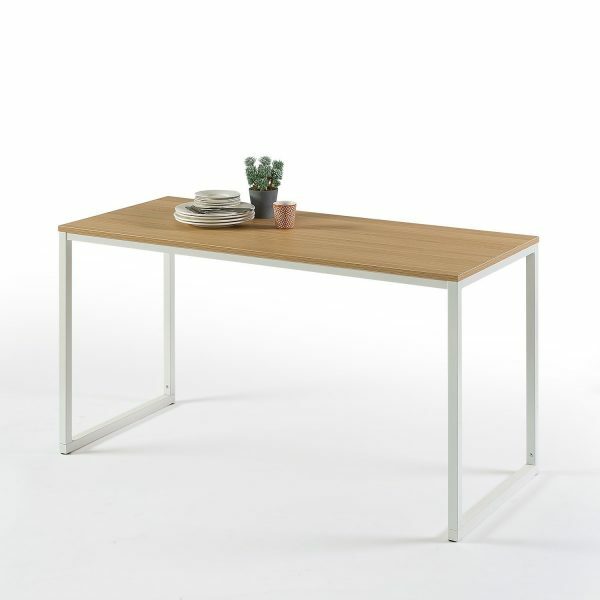 L Shaped Home Office Table With Oak Finish Top & White Legs: If room allows, then consider the style and versatility of this L-shaped desk. 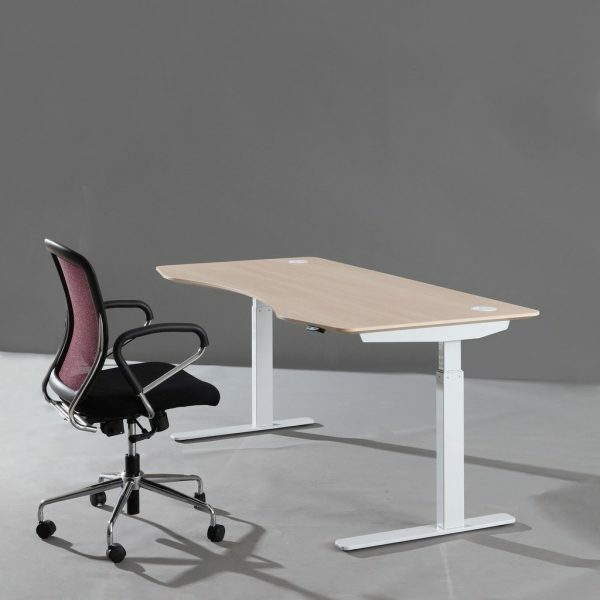 It has a generous amount of desk space that is resistant to stains, heat, and scratches. It is also available in 3 colors: Black, White, and Oak (pictured). 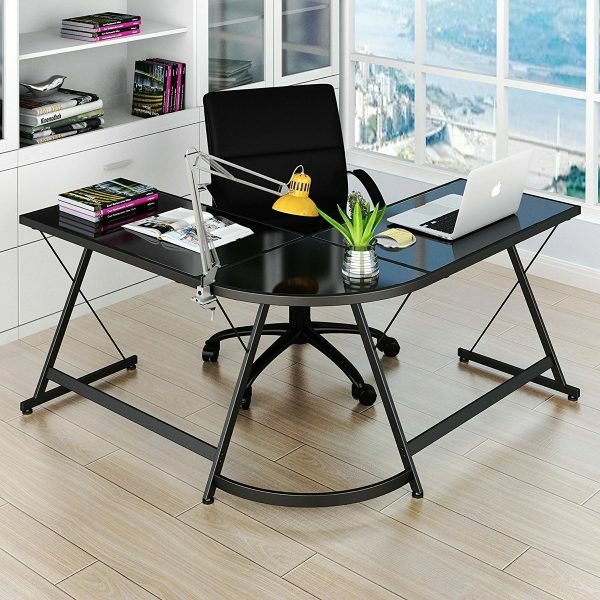 L Shaped Corner Office Desk: This 3 piece black office desk is an amazing deal for both students and professionals alike. With a steel frame and tempered safety glass, it has a sturdy construction with lots of space to spread your projects out. It also features a foot rest bar for added comfort. 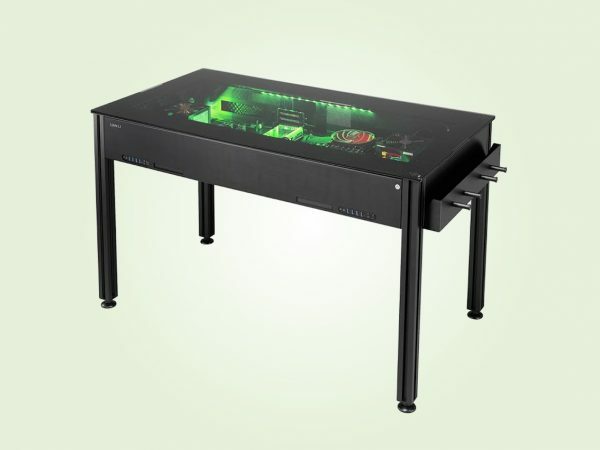 Black L Shaped Desk With Polished Glass Top: This black L-shaped desk not only has a slide out keyboard tray, but it also has a designated CPU stand. Perfect for those who use desktop computers. 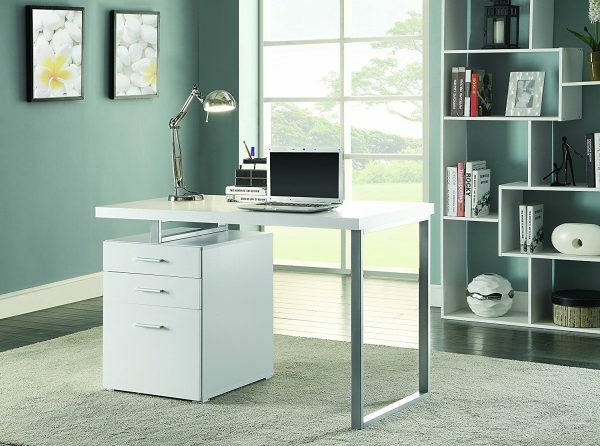 Made with a sturdy steel frame and beveled safety glass, this desk comes in 5 colors options: Multi, Silver, Smoke, White, Black (pictured). Rotating L Shaped Home Office Desk: The HOMCOM rotating desk and shelf combo is both a decorative and functional piece for your office. The unique design allows the desk and shelf to rotate a full 360 in to whatever configuration you choose. Made from durable MDF, stainless steel, and a high shine PVC top, it is available in either White or Black (pictured). Convertible 1 Person to 2 Person Desk: This brilliant 360 degree swivel desk is perfect to cater to multiple needs and design situations. It comes with both shelves and a bonus CPU storage stand. Available in White or Black (pictured). Electrically Powered Height Adjustable Sit To Stand Desk: A sophisticated desk for those looking for the option to stand or exercise while they work. This crossbar free design allows the user to easily integrate a treadmill or stationary bike in to their work routine. It is available in 2 heights and 6 colors. 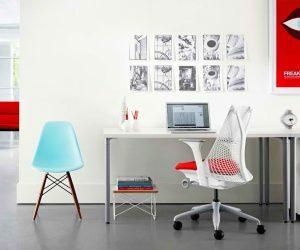 Herman Miller Renew Sit To Stand Executive Desk With Cord Management: The Renew Sit To Stand Desk is a high end option for those looking to avoid sitting all day. It has an advanced cord management system and ample leg room to prevent bumps and bruises. Available in Ash, White and Walnut (pictured). Desk With A Built In PC: This is a computer desk. Literally. If you are the kind of person who likes to snoop in on the innards of your PC, you need this in your life. 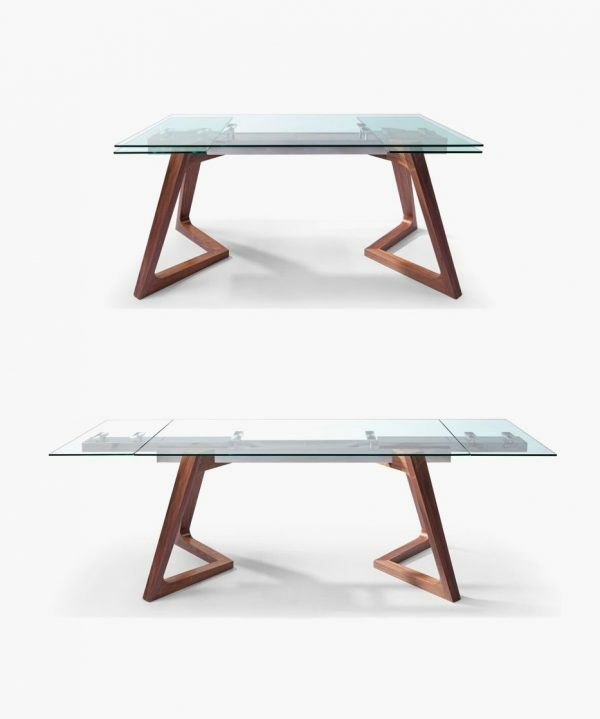 Luxury Designer Glass Office Desk: This luxury glass desk has a sleek and edgy aesthetic. Designed by Isao Hosoe and made in Italy, it is an asymmetrical masterpiece that is sure to be a conversation starter in any home or office. Modern Extendable Glass Office Table With Wooden Legs: This large executive desk doesn’t just have high style, but also plenty of versatility. Each solid wood desk is crafted with a premium glass top that can convert in to a conference table for multiple users, extending from 63″ to 95″ in length. White Modern Minimalist Desk: The clean design and high shine finish on this white desk make it a great piece for a modern office. The 3 drawer storage comes in handy to store your odds and ends and also has the versatility to be put on either end of the desk. Modern White Office Desk With Storage: Style and functionality combine to bring you this luxuriously wonderful L-shaped office desk. It has a built in bookshelf for your organizational needs and is easy to clean with its high gloss finish. Available in Two-Tone Gray or White (pictured). Office Desk Ping Pong Table Convertible: Want to add a little fun to the office? Try a convertible ping pong table office desk. This table is a Spain made product that features a side drawer to hide away the net, bats, and balls when they’re not in use. 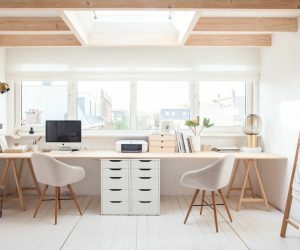 This unique desk is available in both Black and White (pictured). 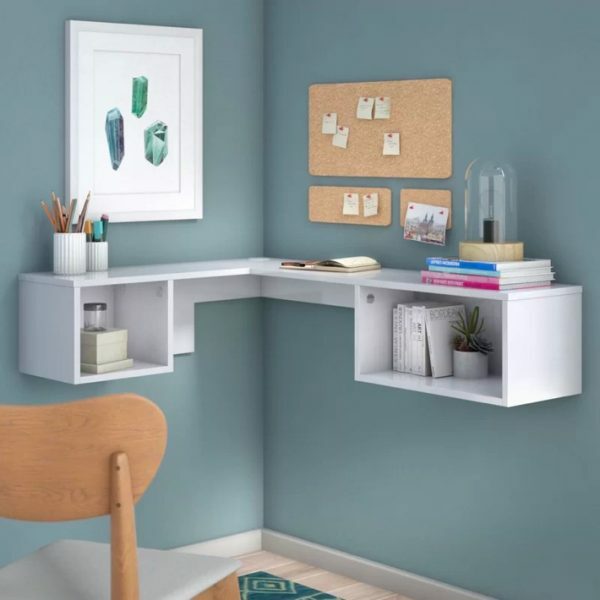 Small L Shaped Office Desk: This small L-shaped office desk with a 6 shelf bookcase offers a multi-functional work station in a stylish two-tone truffle and white color combo. It boasts a fade resistant, easy to clean foil surface and a sturdy construction that is built to last. 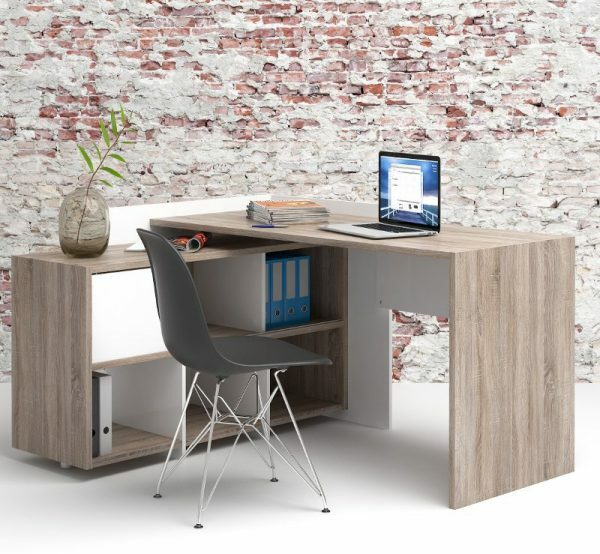 Modern Style L Shaped Office Desk: Whether in a White Lacquer or Zebrano Wood finish, this desk is sure to impress. The sophisticated look of this executive desk adds an elegant touch to any contemporary decor. Available in two finishes with a left or right orientation option for the cabinet. 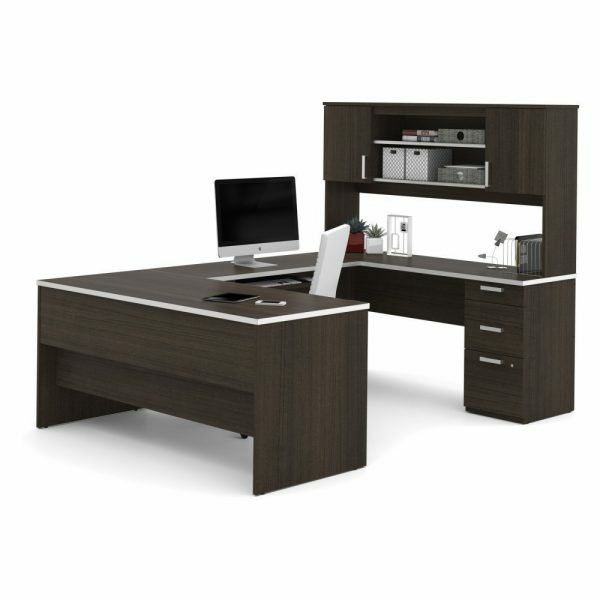 L Shaped Desk With Hutch: This durable L shaped desk in an Espresso Oak finish is both durable and functional. It has an integrated USB hub to keep your devices connected and multiple filing and storage drawers to keep your clutter at bay. If you are looking for larger workspace, then this a great choice as it provides 60 inches of desk space in either direction. This desk is also available in a Harvest Cherry finish. Corner Desk With Hutch: Chrome finished hardware, a rich heather grey finish, and multiple storage nooks help this corner desk strike a balance between modern and practical. The desk pedestal and hutch can be configured on either side of the desk to fit in your space and there are also wire management grommets that help you easily manage and conceal your cables. Modern U Shaped Office Desk: A clean, modern, and professional desk is exactly what you will get with the BESTAR Pro-Linea U-Desk. The commercial grade work surface with a melamine finish is said to resist scratches, stains, and wear. It also acts as a great storage solution with the attached credenza offering a utility drawer, a file drawer with letter/legal filing system, and 3 shelves. Available in 3 colors: White, Oak Barrel, and Bark Grey (pictured). 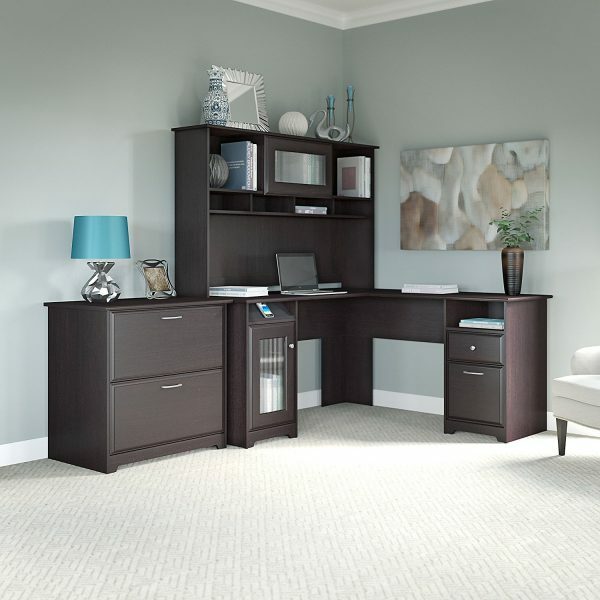 Modern U Shaped Office Desk With Hutch: This U-shaped desk has a beautiful, rich dark chocolate finish, making it the perfect addition to a classically styled office. It also boasts a quiet keyboard shelf / drawers and a lock to secure your file drawer for ultimate privacy. 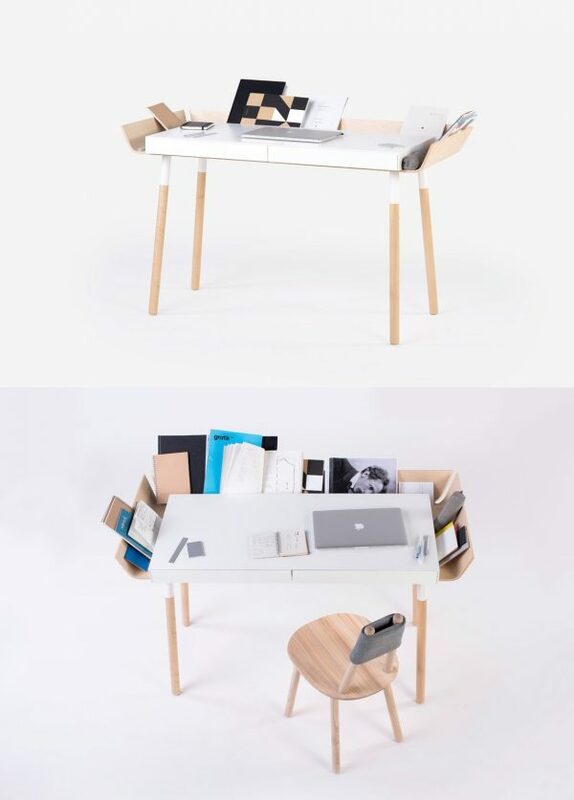 2 Person U Shape Desk With Hutch: This top quality desk with a clean, contemporary design can be uniquely configured to accommodate either one or two people. 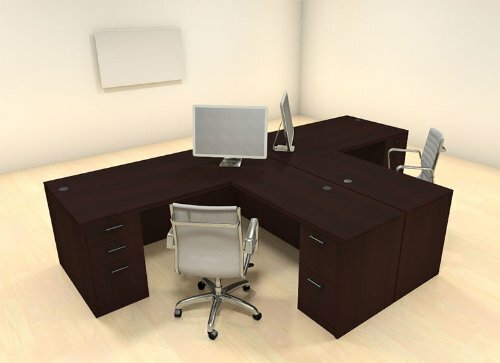 The four-piece set features an executive desk, a bridge, a credenza, and a hutch. It is available in two finishes: Oak Barrel or Bark Grey (pictured). 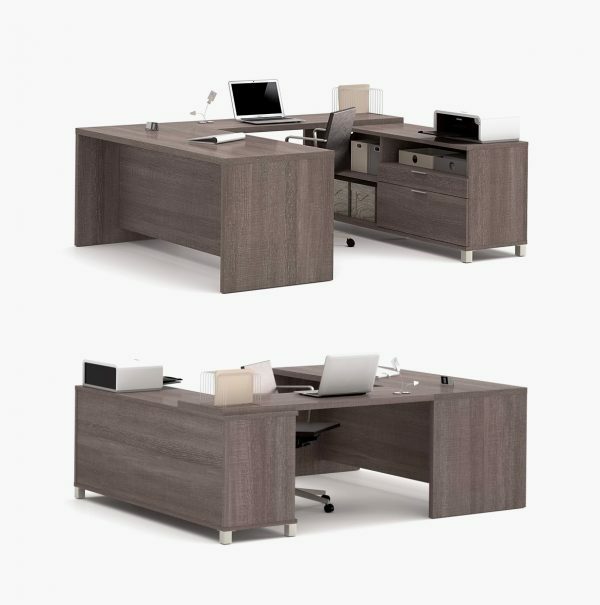 Two Persons Modern Executive Office Workstation Desk Set: With each person getting 5 drawers and a huge amount of workspace, there should be no fighting for turf at this 2 person desk. Lock and key for drawers and wire management grommets are also featured on this model. Available in multiple colors and configurations. Modern Long 2 Person Home Office Desk: Liber-T home office desk is modern space saving solution for the two person office. This simple and effective design comes in a white melamine and walnut laminate finish. It also has a stylish, 3 drawer cabinet to suit your storage and filing needs.